We are a family that tries our best to discern what God desires of us and for us because we are learning more and more that his desires actually do lead to true peace and joy. A few years ago we started to ponder what God desired of and for our family. While we felt very blessed with the life we’d been given, there was a hard-to-desribe sense that God may be asking something of us in some new way. We talked and prayed about it, but couldn’t seem to put our finger on it. 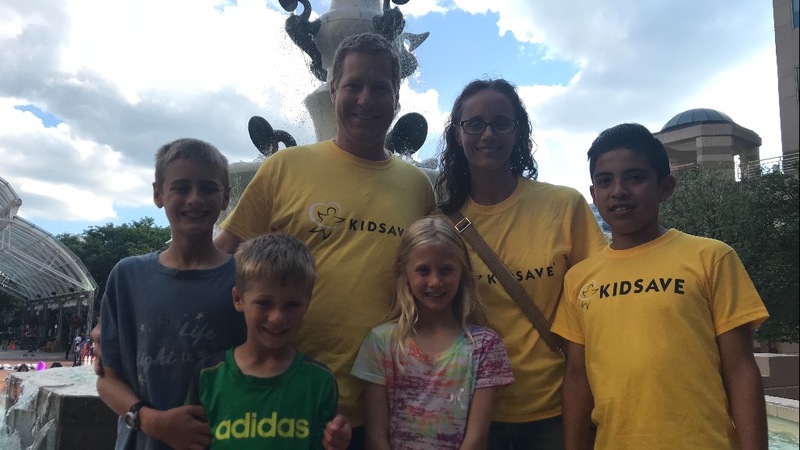 In the meantime, we first heard about Kidsave through another family in our area who had hosted a child from Colombia and was in the process of adopting. We were initially curious about hosting because we considered what a wonderful experience it would be for our family to help a child find a home while learning about and experiencing another culture and language. Overall, our hearts were moved by the compassion and opportunity being offered to children who had little chance of finding an adoptive family because of their age and location. Yet each time thoughts about hosting surfaced, we would push them aside by somehow explaining away why we couldn’t or shouldn’t do it. However, over the course of about 2 years, the thoughts kept cropping back up to the point that we finally decided to simply look more into it. From that point on we decided to just keep taking the next step forward in order to learn more and discern the right decision for our family. Little by little we became more comfortable with the idea of hosting and more convinced that it was something we should do. So we began the process of selecting our host child based on the recommended options presented to us by the adoption agency in charge of training and preparing us to host. We read reports about several different children, and although we didn’t feel overly drawn to any of them in particular, we did say yes to two different options. However, both times we were told that the child we selected had just been matched with another family. We started to lose confidence in the idea that hosting was something we were meant to do. Then Esteban showed up. He had already been matched with a family in another area but that family unexpectedly had to withdraw from hosting and he was placed back in the pool of kids who were in need of a host family. The agency presented his information to us and after reading through it we felt peaceful and somewhat drawn to him. So we said yes once again, and this time found ourselves finally matched with a host child. Our Skype call with him 5 days before he arrived is a moment we will never forget. All five of us were gathered around the computer awaiting the call. Then it connected and he appeared on the screen with a huge smile and a look that showed just how excited he was about seeing us. Our conversation went well and we left that call feeling overjoyed about his impending arrival. From that moment on, through 5 wonderful weeks with him as a guest in our home, we felt a tug in our hearts to consider welcoming him into our home permanently, even though adoption was something we had never really considered before. After his stay with us, he went back to Colombia. We talked and prayed about it a lot, until we finally were able to admit that he already felt like a part of our family and now it was just up to us to bring him home. Since making that decision, our feelings of uncertainty about what God had in store for us have disppeared. While there are sure to be challenges ahead and we still have moments of uncertainty and wonder, there's an underlying sense of peace which tells us that this is what God wants from us and for us. And we've learned from experience that that's exactly where we want to be. STRIPE charges an online processing fee (2.2% +.30 USD per transaction). Your donations will be decreased by this amount. You may also send a check payable to “Lifesong for Orphans”. In the memo line please write “Brady 8084”, to ensure it is credited to our account. Please mail to Lifesong for Orphans, PO Box 40, Gridley, IL 61744.